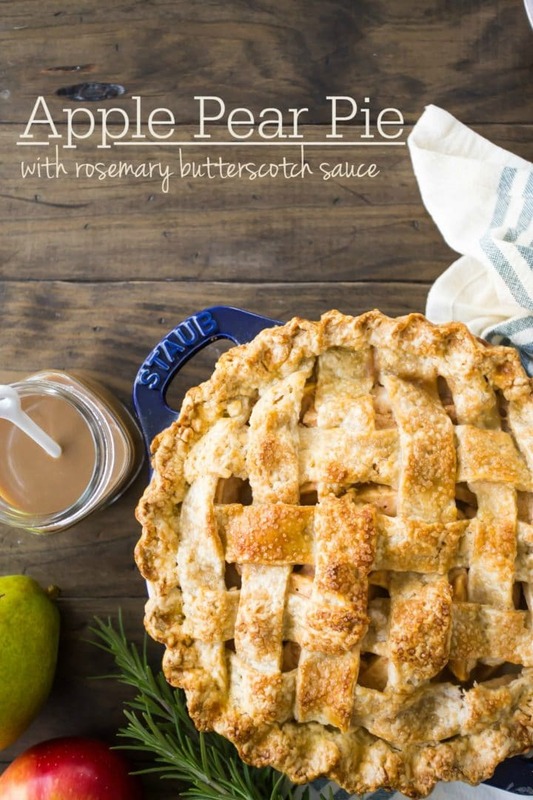 Celebrate fall with this delicious apple pear pie! 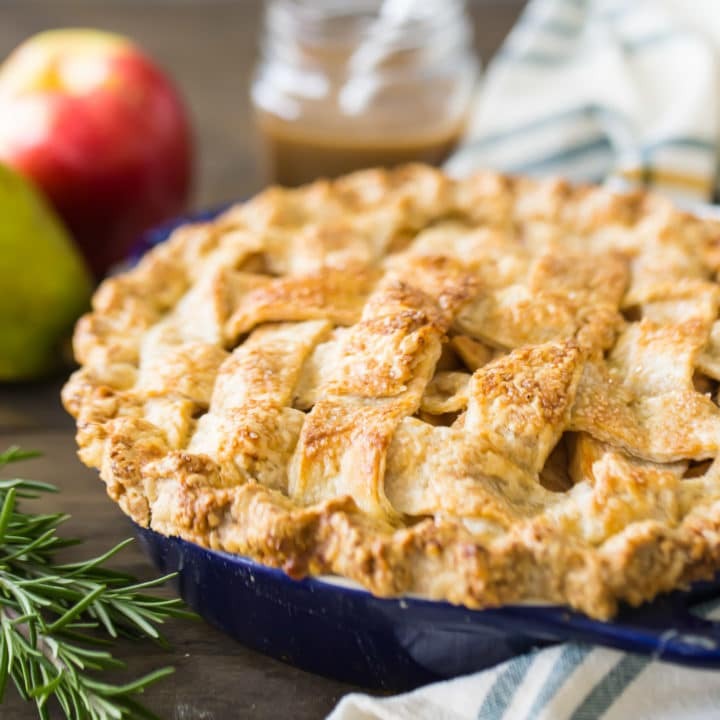 The combination of fruits is divine, along with the buttery crust & a unique rosemary butterscotch sauce. Today I am bringing you what will probably be the last pie recipe of this Thanksgiving season. I’ve been on a real pie tear these last few weeks, posting recipes for classic apple pie, pumpkin pie, and pecan pie. 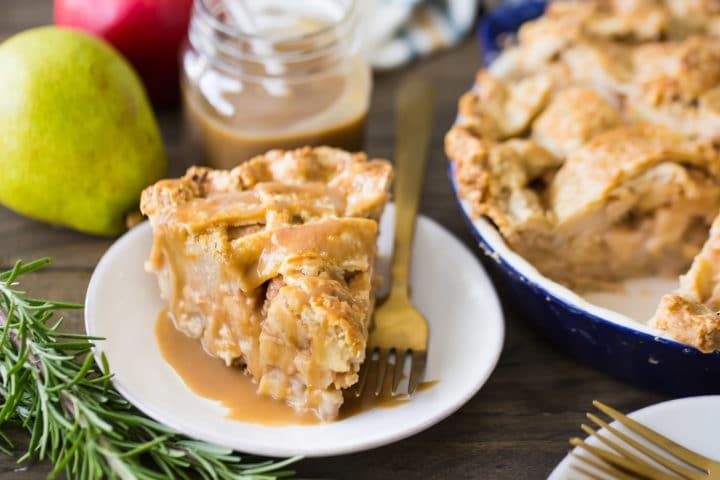 They’ve all been wonderfully old-fashioned and traditional, but today I thought maybe we could mix things up with a combination of seasonal fruits, brought together with some unique but delicious fall flavors: apple pear pie with rosemary butterscotch sauce! Have you ever thought about combining more than one fruit in your pies? 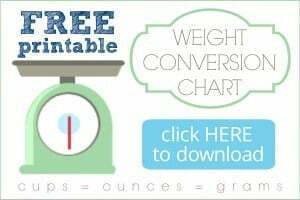 I’m hear to tell you that it works very well! Apples and pears are a natural together. The tart, firm apples complement the sweet, tender pears in the most delicious way. Rather than just using sugar to sweeten the filling, we are whipping up an easy butterscotch sauce. It’s got a deep and rich buttery brown sugar flavor that brings out all the best in the fall fruits. Steep a sprig of fresh rosemary in the sauce, to give it a subtle but unique woodsy flavor. Your guests will love this pie! It’s just a little different, but all the flavors work so well together. Give it a try and let me know what you think! 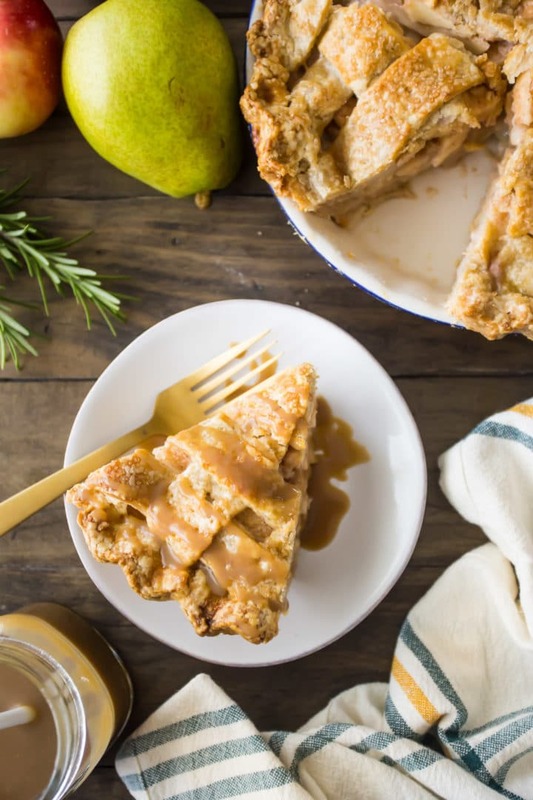 I love the fruit combo in this pie, and the butterscotch sauce with rosemary sounds AMAZING!! This looks SO good! Thanks for this wonderful recipe. I am just wondering what I can do if I wanted to leave out the rosemary? My mom and I aren’t big fans but I really want to try this out! Hey Jenna! The rosemary is optional. Go ahead and leave it out if you’d like!